8-2-Eat is my food-focused list series. A perfect Friday distraction. I shared some cookie recipes earlier this week. Here are 8 of my favorite from the last few years. Chocolate Saltine Bark. This is one of those recipes where the enjoyment it brings is is inverse to its difficulty. It's so easy! Basically crackers baked with butter and sugar coated with melted chocolate and nuts. Almond Lace Cookies. As a kid, my mom had a friend who would make these, and I loved them. They're a wonderful choice if you want something different that's elegant and old-fashioned. Peanut Butter Blossoms. The first of several classics with peanut butter--this one topped with a Hershey's Kiss. 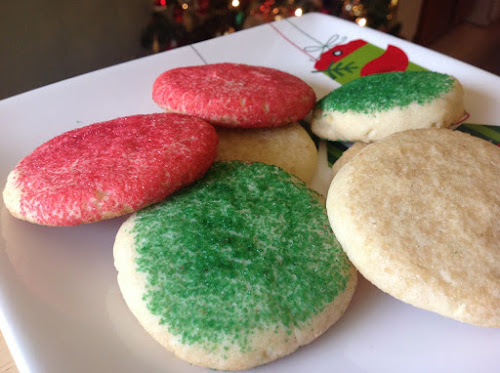 Old Fashioned Sugar Cookies. There are a lot of sugar cookie recipes floating around out there, but this one is by far the best I've ever had. It's buttery and sweet with the perfect texture. Peanut Butter, Oatmeal and Chocolate Chip Cookies. This is the perfect cookie for the indecisive cookie lover. Can't choose between peanut butter, oatmeal or chocolate chip? Turn that "or" into an "and" and enjoy. Pumpkin Snickerdoodles. Classic snickerdoodles with a pumpkin twist. Molasses Sandwich Cookies. The fresh lemon filling is a nice contrast to the molasses flavor of this sandwich cookie. Peanut Butter Cookies. My longtime favorite and one of the first things I ever learned to cook.